Randa started as a furniture designer, but having children herself spurred a career change and she joined the Education Ministry as a teacher. After seven years of teaching arts education, she received the Queen Rania Award for Excellence. Randa sees her role at Al Amawie District Secondary School in Amman as that of a guide on academic, personal, social and even emotional level, and she aims to provide a positive energy around herself. Helping students develop general skills, Randa teaches them techniques for researching, brainstorming, decision making, team work, communicating and debating, and she exposes them to IT.She organises expositions of student art works on topics like family violence, women’s rights and healthy eating, and she managed to obtain funding from Starbucks to improve the facilities at her school. 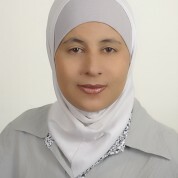 Continuing to educate herself after becoming a teacher, Randa gained several university qualifications and has been training teachers across Jordan, including giving lectures at the Faculty of Education at the Jordanian University. She co-authored a booklet containing many of her educational success stories, and was selected by the Education Ministry to contribute to national school books.